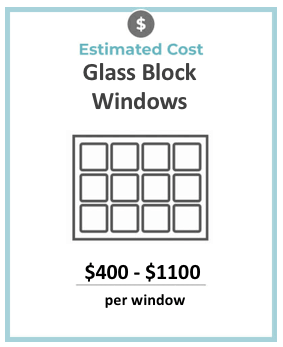 The average cost for a replacement glass block windows installation is $400 to $1100 per window + labor costs which can average around $38 per hour depending on your local window installers average price. See local window prices below. There’s something unique about glass block windows over standard single or double paned windows. They’re thicker and they create a trendy style that you don’t see everywhere. This is why many offices and some homes rely on glass blocks in different areas. They’re just the right accent to really improve the look of a space. Those block glass windows aren’t just there to look good though, most of the time they provide another purpose as well. There are plenty of good reasons to have glass block windows installed in your home, bathroom, or basement. One of the main reasons that glass block windows are used is to offer privacy in some way. They are commonly installed in bathrooms, or as dividers between rooms for this very reason. While it’s possible to get see-through glass block windows, many times they come with an obscured view. Sometimes this is achieved by frosting the glass, and other times the glass simply has a pattern that makes it impossible to see through it. Either way there are many glass block window options that work well for privacy. While someone might want privacy in the bathroom, it doesn’t make sense to block out all the light to achieve that privacy. Glass blocks allow light to come through while still providing privacy so they are a great options in dark spaces like basements where you wouldn’t want to use curtains or blinds. Glass block windows are known for offering an appealing and upscale option for room dividers, shower doors, bathrooms, basements or pretty much any other part of the home that you want to create a divider for. If you’re looking for a way to boost the look of your home, it makes sense to consider adding these windows in place of other windows, or just to let a bit more light through to darker areas of your home. Since basement windows don’t have to be accessible, and you don’t necessarily need to open and close them, glass block windows are a great option. 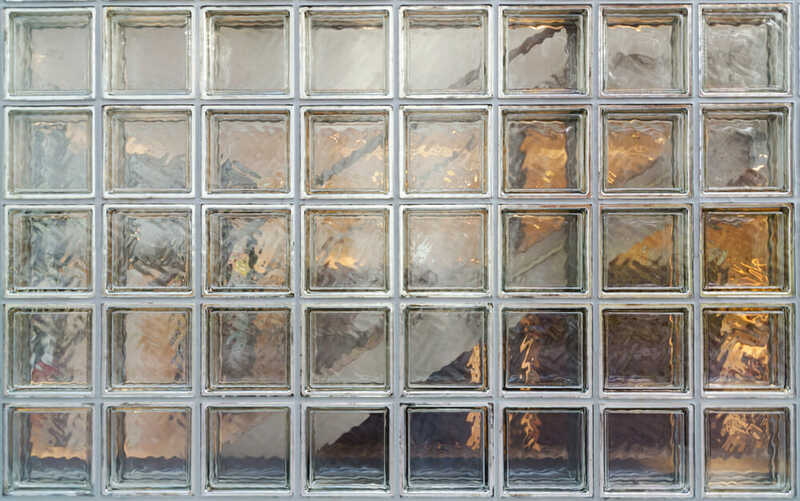 Glass block windows will bring some light into the space, but they make it difficult for criminals to break into. While a criminal could easily smash through a standard basement window, and crawl through it if it’s large enough, a glass block window is thicker and much harder to get through. This helps keep unwanted people out of your basement throughout the year. Many people choose glass block windows in order to keep moisture out of their basements, especially in flood zones. Since the windows are a type of masonry they are known for creating very durable seals that prevent water when installed properly. These windows are very effective when first installed, but over time the joints will wear out and have to be resealed. It’s important to have the windows resealed about once every five years to prevent water penetration. While the windows would likely hold a waterproof seal for much longer than that, taking care of the task once every five years helps ensure that no water is ever let in. One thing to look out for when ordering glass block windows is the installers that plan on setting up the blocks individually in the space of your home. Often times, an installer piecing the window together in the frame will end up with gaps, uneven mortars and a window that doesn’t hold water out effectively. It’s much better to have the window built in a shop or other controlled environment to the dimensions of the space, and then have it installed as one single piece. This is typically an option with any type of glass block window installation, even when it’s being put into a shower door. Though most glass block windows are built for appearances, security and waterproofing. There are some glass block windows that are built with a vent in them. This small vent panel is a tiny window on a hinge that can be opened and closed. The nice thing about the small ventilation panel is that it’s small enough to still offer that same level of security against intruders, and the space where water can flow into your home is kept very minimal. If you want a way to air out your basement when it gets a bit stuffy, it makes a lot of sense to consider a ventilated variation on the standard glass block window. Whether you’re interested in waterproofing your basement, adding a cool design aspect to your home, or providing your home with privacy and natural light all at the same time, there are plenty of reasons to consider glass block windows.